In the spirit of Mindy Kaling’s bestseller Is Everyone Hanging Out Without Me?, a collection of humorous, autobiographical essays from Kunal Nayyar, best known as Raj on CBS’s #1 hit comedy The Big Bang Theory. Of all the charming misfits on television, there’s no doubt Raj from The Big Bang Theory—the sincere yet incurably geeky Indian-American astrophysicist—ranks among the misfittingest. Now, we meet the actor who is every bit as loveable as the character he plays on TV. 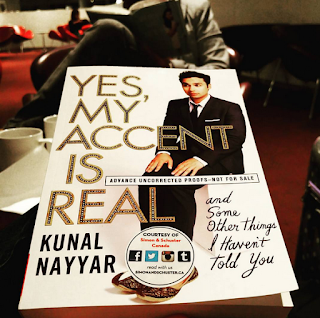 In this revealing collection of essays written in his irreverent, hilarious, and self-deprecating voice, Kunal Nayyar traces his journey from a little boy in New Delhi who mistakes an awkward first kiss for a sacred commitment, gets nosebleeds chugging Coca-Cola to impress other students, and excels in the sport of badminton, to the confident, successful actor on the set of TV’s most-watched sitcom since Friends. Full of heart, but never taking itself too seriously, this witty and often inspiring collection of underdog tales follows a young man as he traverses two continents in search of a dream, along the way transcending culture and language (and many, many embarrassing incidents) to somehow miraculously land the role of a lifetime. Last month JG and I were getting ready for a short trip to Washington D.C. and instead of planning out my outfits for our lunch with PoTUS (didn't really happen....will likely NEVER happen...) I was more concerned about which book(s) I was going to take with me. Luckily, Kunal Nayyar arrived on my door step (his book, not the man himself) and saved the day. Thank you Catherine! Kunal and I started to get acquainted as soon as we passed airport security. 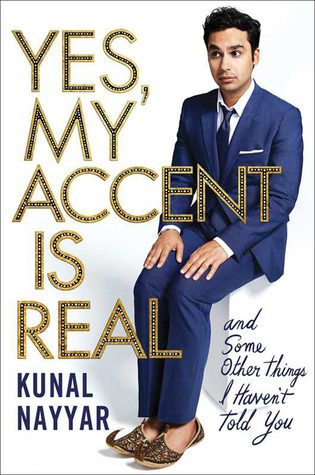 Yes, My Accent is Real is a collection of autobiographical essays and is filled with many (hilarious) reflections of Nayyar's life leading up to his big break. I have to confess, I was once a fan of The Big Bang Theory, but life has gotten in the way of our relationship. Raj, Kunal Nayyar's character on the show was and still is one of my favourite characters. His medical condition, selective mutism, has always been quite intriguing and I'm happy that Nayyar addresses it in his book. We also get a look into Nayyar's privileged upbringing in India, his close relationship with his parents and his struggles to attain his "American Dream". If you're looking for dirt on your favourite Big Bang Theory character, this book will likely disappoint.Yes, My Accent is Real is, however, a fun and engaging read written by an author that is genuine and intelligent. The book is filled with many moments that will make you laugh out loud. Tip: Do not read this book while watching the safety video on a flight. The look the flight attendant gave me was not so pleasant as I chuckled through the "How to put on your life jacket section". I thoroughly enjoyed Kunal Nayyar's debut novel and I hope it won't be the last. I would like to browse through the collection of autobiographical essays since it is filled with many different topics. thanks a lot for this book! you show the story of your life, I' m sure there will be a lot of people willing to buy this book! Thanks for the properly-written review. I really appreciate your desire to help us figure out what is right for our minds! As it turns out, the book is required my attention!